With no tailwinds to support economic growth, the equities market appears a little bleak at the start of 2019. In that context, Intellidex analysts have sifted through the market to identify companies they believe offer value to investors. Intellidex believes companies with rand hedge qualities (those with operations outside of SA and net exporters), low debt levels and minimal exposure to government business are likely to fare better. With no economic tailwinds for the local economy we do not expect robust growth from consumer-dependent industrials such consumer goods, consumer services and health care – particularly those heavily geared towards the domestic economy. SA started 2018 on a very strong footing, buoyed by the election of Cyril Ramaphosa as ANC president in late 2017 and later as president of the country. Confidence was high: the FNB/BER consumer confidence index skyrocketed to 26 points (2017Q4: -8) for the first quarter of 2018, its highest level since the BER started measuring consumer confidence comprehensively in 1982. The RMB/BER business confidence index jumped 11 points in that quarter, its highest increase since 1975. However, a confluence of adverse economic and political developments deflated confidence as the year progressed. Inflationary pressures due to rising petrol prices, VAT increasing to 15% and the sugar tax quashed consumer sentiment and the economy slipped into a recession in the second half of the year. The rand was as volatile as usual, influenced by local and global events. The main global influence on the currency were the trade wars involving the US, China, EU and Canada in particular. 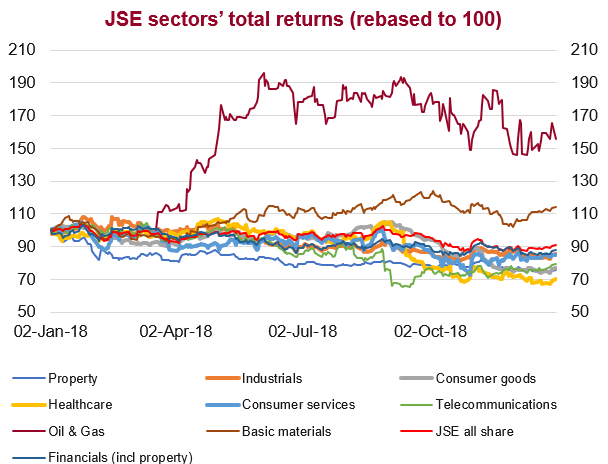 All the JSE sectors (see graphs below) except for resources ended the year in the red. Health care was the biggest loser, shedding 30%, followed by property, which lost close to a quarter of its value. While market uncertainty is elevated, the JSE has experienced a rally mainly due to external forces. Economic data released so far show the economy remains under pressure, although there are a few positives. Mining production fell by 6% for the first 11 months of 2018. Contrarily, November retail sales increased by 3.1%, indicating that black Friday sales performed better than last year, with household furniture and appliances leading the way, jumping 13.5%. However, recent trading updates by retailers Woolies and Mr Price have disappointed, dragging the sector down on the local bourse. Overall we believe the performance of local equities will be shaped by weak economic growth (Intellidex is forecasting 1.5% GDP growth this year and 1.9% next year); a weak currency; stable inflation; an interest rate hike; no significant policy reforms bar land reform; unsustainable state owned-enterprises debt; a credit ratings downgrade; and a simple majority ANC election victory. On the international scene there is a lot of noise characterised by a confluence of conflicting but largely weak economic data. Some analysts are arguing that this might turn out to be a good omen as governments may be compelled to pursue loose economic policies. This thinking may have birthed the equities rally in the first week of the year after the US Federal Reserve signalled a more accommodative monetary stance on the back of weaker-than-expected economic readings. China has weighed in by promising to implement a number of stimulus measures, including tax cuts, to prop up its economy, which experienced one of its worst years in recent memory last year. If the trend of accommodative policies continues, it could be good news for equity investors both at home and globally. The US-China trade talks are so far going well and present a potential surprise to the upside. However, the Brexit scenario remains a risk. We think companies with rand hedge qualities (those with operations outside of SA and net exporters), low debt levels and minimal exposure to government business are likely to fare better. With no economic tailwinds for the local economy we do not expect robust growth from consumer-dependent industrials such consumer goods, consumer services and health care – particularly those heavily geared towards the domestic economy. Consumer staples are faced with the double problem of rising input costs and muted consumption growth. However, considering the low valuations and the defensive nature of most stocks in this sector, there could be some pockets of good buys. Resources are well positioned to outperform other sectors again in 2019. Analysts expect commodity prices to remain stable in 2019. That, coupled with our outlook of a weaker rand, will see some mining houses continue reaping rewards from cost-cutting initiatives implemented during the commodity crisis. The sector’s valuations, with a price:earnings ratio of 12.2 and a dividend yield 4.07%, are still attractive. Financials are dependent on national demand for savings and loans. 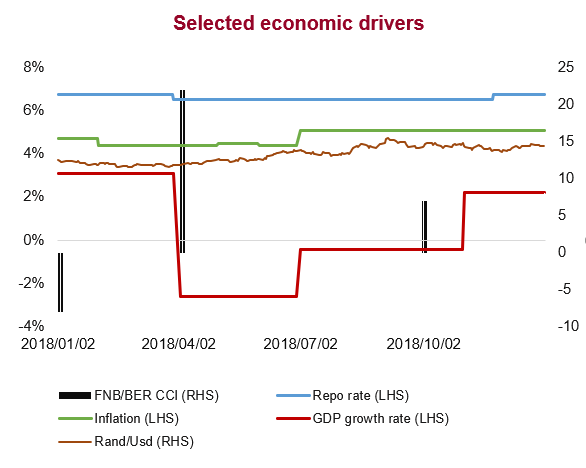 Positive (albeit low) GDP growth will be good for the sector while a possible credit downgrade of SA ratings and the prospect of a repo rate hike pose the biggest risks to the sector. The discovery of accounting errors in Rolfes’ FY17 financial results heavily dented its reputation. It then produced poor FY18 results and those factors weighed on its share price performance in FY18. However, after a serious clean up the group is likely to rebound in 2019. The management team has been strengthened with a new group CEO and a CFO, while new people have also been brought in at top positions at subsidiary level. Most of the sticky issues have been addressed. With everything now in place we expect management to focus on growing the business during FY19. It plans to ramp up exports for its food ingredients business, which contributes close to half of its top line, into southern African countries. That will complement the agriculture division, which commands a strong customer base with leading positions in niche markets that have high barriers to entry. Those factors give Rolfes some pricing power and the ability to defend its market positions. Both businesses can be scaled up through new product development, which will boost profit margins. Rolfes’ weakness lies in its water and colour businesses. The colour division, which has been a drag on profitability, sells into a commoditised market where the group has very little pricing power. The water division operates in a good segment but Rolfes’ approach of relying heavily on short-term tenders seems opportunistic and unreliable. Nonetheless, the two divisions are too small to influence our view on the company. While Rolfes’ price:earnings ratio (PE) of 22.13 is a bit intimidating, it is exaggerated by significant once-off items which were expensed during FY18. We expect the ratio to unwind to around 11.96 by the end of FY19 when the cost base normalises. We value Rolfes at 365c/share, 35% higher than its current price of 271c. A new management team led by chief executive Mteto Nyathi is already delivering ahead of what many investors had anticipated. Since taking over in July 2017, management has added new lines of revenue (and exited unprofitable ones), reduced debt levels and reintroduced a dividend. The resumption of a dividend payout in particular attests to the confidence that management has in the new direction the business has taken. The official confirmation of its repositioning efforts came when its JSE sector classification was switched to computer services from electronic equipment. Altron has pivoted towards the ICT sector, focusing on cyber security, cloud services, advanced analytics and mobile applications. This is a global trend and based on numerous research reports, the outlook for these subsectors is encouraging. Most forecasts show that the ICT subsectors will grow by double-digit rates in the short to medium term. Furthermore, about 57% of group revenue is generated offshore, which cushions it from SA’s low-growth environment. The cross-selling of certain South African offerings in the UK market is gaining traction. The group has repositioned and sold off non-core assets faster than initially expected, although it is still to receive cash from acquirers. This cash infusion will improve its net debt-to-equity position to 30.4% from 43.9%. In order to properly entrench itself in the ICT sector, Altron is pursuing some strategic acquisitions. It recently acquired iS Partners, which adds to its existing Microsoft business offerings, enhancing its cloud and data analytics offerings. The new management is driving top-line growth, improving profitability and cash generation and revamping the balance sheet. The focus now is on organic growth and bedding down acquisitions. It has also entered new partnerships with global household names such as Microsoft and Huawei. On a PE of 12.5, we expect Altron to experience average annual revenue and earnings growth of 14% and 26% respectively in the short to medium term. Its potentially high earnings growth and the resumption of dividend payments is likely to propel the stock to new highs in 2019. We have a price target of R24/share, which translates to upside potential of 35%. At first glance, the construction sector appears to be an outright sell. That is because it has been depressed for a long time and short-term prospects remain gloomy. The reality is that there is just not enough work coming to the market and margins on the little work that is available are razor thin. However, we believe there are some exciting opportunities for patient, long-term value investors. WBHO is one of them. WBHO has good volumes of work – mostly outside of South Africa – that will enable it to perform well in 2019. Fundamentally, the business is in a sound position with a healthy balance sheet and margins are set to remain stable. Serviced debt – finance leases, bank loans, etc – make up about just 4% of shareholders’ funds. Its operations are generating enough cash: operating activities netted R928m during FY18, which is 13% up on the previous year. Free cashflows – cash after capital expenditures – have been positive over the past five years, which tells us it can fund expansion projects internally and can pay dividends. WBHO’s diversification is its most valuable asset. During FY18 only 30% of its earnings were generated locally, with the rest emanating from Australia and the rest of Africa. It recently added the UK to its list of markets, which will see about 20% of its order book coming from that region. Prospects in those markets are better than SA’s. Similar to our investment case for Rolfes, EOH is a turnaround story. The company, which was an investors’ darling not too long ago, fell out of favour following allegations that one of its subsidiaries had corruptly secured some public sector contracts. The market hacked off a huge chunk of the group’s value, slicing its PE to a fraction of what it was prior to the scandal. We think a turnaround is imminent. The board and management have taken the necessary steps to reduce the group’s exposure to the public sector and ensure that the remaining government contracts are clean. It disposed of its stake in GCT, which was implicated in corruption, and exited some public sector projects. The public sector division was also dissolved. The auditing committee reviewed all material contracts, with the help of law firm ENS and did not raise any concerns. Parallel to that, management implemented initiatives to optimise the cost structure and promised to prioritise working capital and capital structures during FY19. These measures will help the group reverse the low levels of profitability. Additionally, the board reconfigured the group into two distinct and independent businesses, each with its own chief executive, unique brand and identity, with separate go-to-market strategies. The ICT businesses now operate under the EOH brand and the specialised solutions for high-growth industries businesses fall under the Nextec brand. Zunaid Mayet (who had succeeded the former group CEO, Asher Bohbot, who stepped down in 2017) relinquished his role to become chief executive of Nextec. He was replaced by Stephen van Coller, who previously held senior M&A positions at MTN group, Barclays Africa and Deutsche Bank SA. Despite the challenges, EOH remains capable of delivering decent growth. The group operates in a segment whose relevance is unquestionable. Expenditure on information and communication technology (ICT) is expected to remain strong as companies maintain their legacy systems and invest in new-generation digital technologies. As the biggest player in the sector, EOH stands to benefit from that. However, its going to be difficult for the group to grow at its historical levels. Investor sentiment on the company is still negative, hindering its acquisition strategy. Previously, EOH was able to use its high-flying share price as currency for acquisitions. However, with the share price rating now less than half of what it was about three years ago, any acquisitions are going to be costlier as EOH will have to issue more shares. That means any large acquisitions that would make meaningful contributions to growth will not be possible without massive earnings dilutions. Overall, we think this counter deserves a second look from investors. Its market valuation is way below its intrinsic value. Its share price rerated significantly during the second half of last year but we think it is not yet at levels that reflect its growth promise. Our model values EOH at R62.27/share, which is almost double its current market value. The positive retail sales data for November published by Stats SA, where household furniture and appliances sales impressed with growth of 13.5%, bring to mind a certain branded consumer durables wholesaler. We believe Nu-World will benefit from this in its next reporting period. The company exhibits attractive value attributes which increase its margin of safety. Nu-World remains a deep value small-cap counter that goes largely under the radar. It is trading on a giveaway multiple of five times earnings, which is lower than its historical two- and five-year average earnings multiples. This is complemented by a high dividend yield of more than 7%. Nu-World’s second-tier household durable products appeal in times of low household income growth, as is the case in SA. Management’s drive to expand product offerings and rationalise costs and the supply chain is having a positive impact. Its operating margin has increased over the past few years, resulting in double-digit growth on its bottom line in the past two years. Similarly, return on equity has improved to almost 17% from just above 10% five years ago. International business volumes have been less impressive, although profitability has improved. We think Nu-World’s recent market expansion in parts of Asia, specifically India, should see decent volume growth and offset low growth in SA. Although management says it is focusing on improving working capital, there has been some deterioration in the debt position. Most of the debt emanates from a bank overdraft which is being used to fund working capital. However, the net debt-to-equity position is not a cause for alarm at less than 1%. Despite these inherent risks we think the undemanding earnings multiple and generous dividend yield provide a cushion. We think it might serve up a positive surprise when it reports its 1H19 results. We have a target price of R55/share, which translates to upside potential of 22%.